Lord and Ladies costumes after the edict of 1633. Home » Lord and Ladies costumes after the edict of 1633. 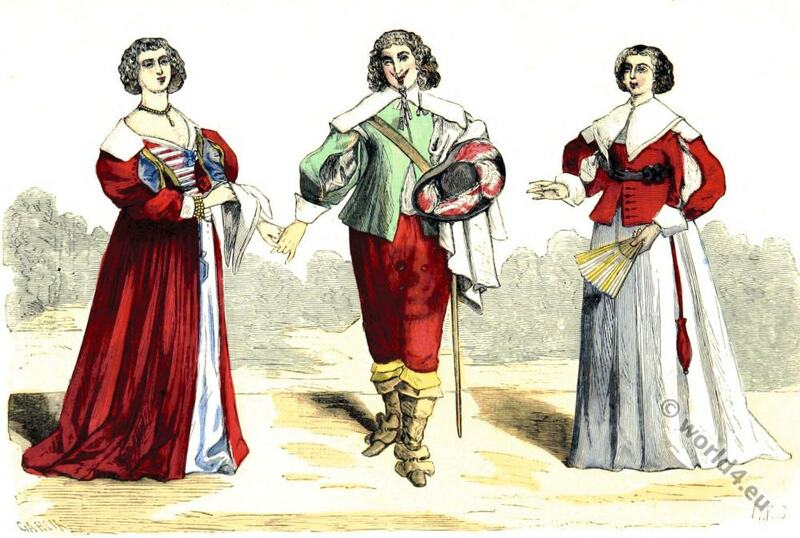 Lord and Ladies costumes after the edict of 1633. According to Abraham Bosse. Reign of Louis XIII. Costume de Seigneur et de Dames. Apres l’édit de réforme 1633. D’après Abraham Bosse. Edict of 1633. The Sumptuary law. In 1629 and 1633, Louis XIII of France issued edicts regulating “Superfluity of Dress” that prohibited anyone but princes and the nobility from wearing gold embroidery or caps, shirts, collars and cuffs embroidered with metallic threads or lace, and puffs, slashes, and bunches of ribbon were severely restricted. As with other such laws, these were widely disregarded and laxly enforced. A series of popular engravings by Abraham Bosse depicts the supposed effects of this law. Source Wikipedia. Abraham Bosse (1604 – 1676) was a French engraver and etcher. Bosse provided a tremendous amount of leaves with culturally and historically interesting descriptions of ceremonies, festivals and scenes from the life of the people. He was a friend of the architect and mathematician Girard Desargues and presented some of his ideas are in popular form, as this could Desargues himself. This entry was posted in 1633, 17th Century, Ancien Régime, Baroque, France, Nobility and tagged Baroque era, Paris à travers les siècles on 8/27/15 by world4.